Mao Asada is in this group, she gets a big applause as she hits the ice. She looks more composed than last night. and since we have a snow day pretty well across the island, I'm thinking there's a lot of NLers watching right now. All in all I think she'll be happy with her Olympic debut. A great short program in the team event and she gets to take a silver medal home. This was a good bounce back from last night as well. A few misses, but overall a good program from Kaetlyn. I'm going to pop down to the mixed zone to have a chat with my fellow Newfoundlander! 112.80 for Kaetlyn in the Free Skate giving her a total score 168.98. So happy she was able to come back with that kind of performance after last night. I can't remember when she's been that emotional after a skate. A wonderful skate by Mao. 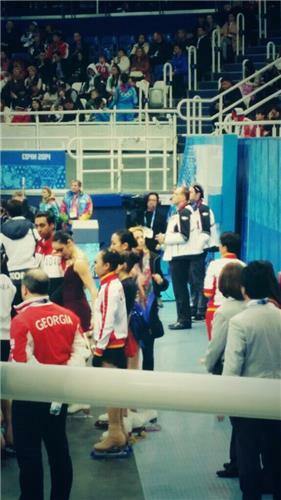 She has stated that this is her last competition. What a beautiful skate to end her successful career. I am almost in tears watching her in tears. 142.71 for Mao in the free skate giving her a total combined score of 198.22. The ice is being resurfaced, we'll be back shortly to bring you up-to-the-minute updates on the final two flights. Stay tuned! Mao kills it with absolute ease and poise! Ending in tears and a standing ovation from the crowd...leads with 198!! 3rd flight on the ice warming up. 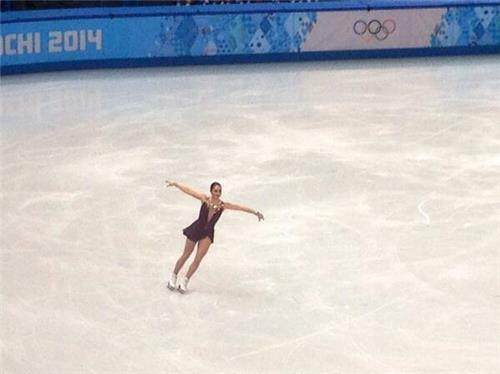 Zijun Li from CHN on the ice. Edmunds scores 122.21 for a total score of 183.25. She is currently in 3rd place. Weinzierl of GER up next. And the Rossiya chants have begun already with the first glimpse of Lipnitskaya and Sotnikova as they prepare to come out for warmup. Weinzierl finishes with a score of 147.36. She is currently in 12th place. Interesting costume note, at least for me... After a few years in which it seemed every girl was going sleeveless, there are four in this group who all have long sleeves. Lipnitskaya will be up first in this flight, followed by Kostner.